The participants after leaving the Woolworth’s by a side exit. (L-R): David Richmond, Franklin McCain, Ezell Blair Jr., and Joseph McNeil. (No photographers were allowed into the Woolworth’s during this first protest.) © Corbis. 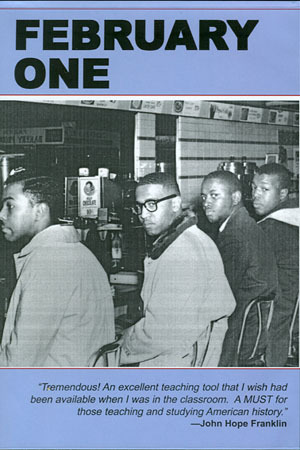 On Feb. 1, 1960, four African-American North Carolina A&T University students, Ezell Blair Jr. (now Jibreel Khazan), David Richmond, Franklin McCain, and Joseph McNeil, began a sit-in protest at a Woolworth’s whites-only lunch counter in Greensboro, North Carolina, where they had been refused service. Little Palace Cafeteria in 1943 with Pauli Murray and other Howard University students in Washington, D.C.
Katz Drug Store Sit-in in 1958 with high school teacher Clara Luper and the NAACP Youth Council in Oklahoma. Dockum Drug Store Sit-In in 1958 with students Ron Walters and members of the NAACP Youth Council in Wichita, Kansas. The Bennett Belles were at the forefront. 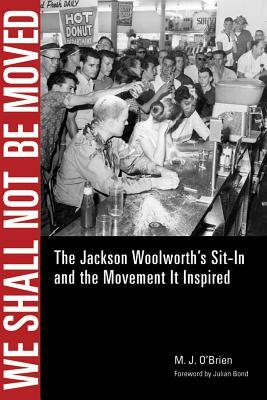 A lot of folks talk about the 1960 Woolworth sit-in, but many don’t realize that that was actually planned on Bennett’s campus. Bennett women were in leadership roles in terms of planning that movement. The four men sat down on Feb. 1, 1960, but Bennett women had planned to be part of it as well. And so they were very instrumental in doing that initial work and also continuing that work. Read in full. The Greensboro sit-ins inspired a mass movement across the South. By April 1960, 70 southern cities had sit-ins of their own. Direct-action sit-ins made public what Jim Crow wanted to hide–Black resistance to segregation. By directly challenging segregation in highly visible places, activists grabbed the attention of the media. . . The sit-ins told Black youth that they had power to capture national attention. “Before seeing these sit-ins,” SNCC’s Charlie Cobb said, “Civil Rights had been something grown-ups did.” Continue reading at the SNCC Digital Gateway. Find resources below to teach about the sit-in movement. Book – Fiction. By Carole Boston Weatherford. 2007. 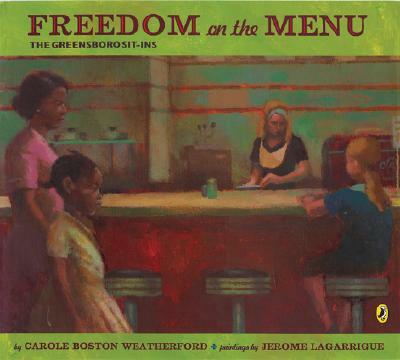 Historical fiction in an upper elementary picture book about the Greensboro sit-ins. Book – Non-fiction. By Andrea Davis Pinkney. Illustrated by Brian Pinkney. 2010. 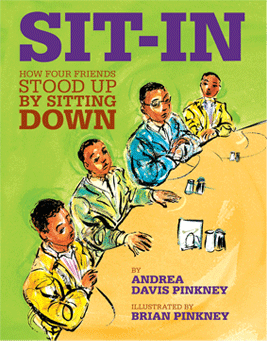 A picture book about the 1960 Woolworth sit-ins. Book – Non-fiction. By M.J. O’Brien. 2014. 340 pages. An up-close study of the story behind the iconic photographs of the Jackson, Mississippi sit-ins. 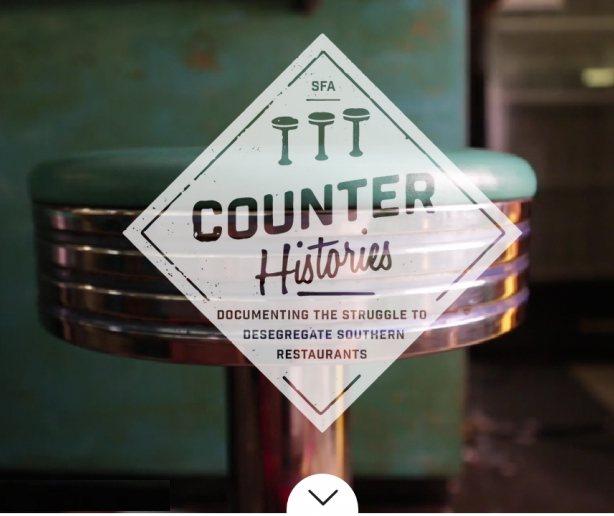 Five short films that document the civil disobedience staged at segregated lunch counters in the 1950s and 60s. Film. Produced by Dr. Steven Channing. 2004. 61 min. The story surrounding the 1960 Greensboro lunch counter sit-ins. 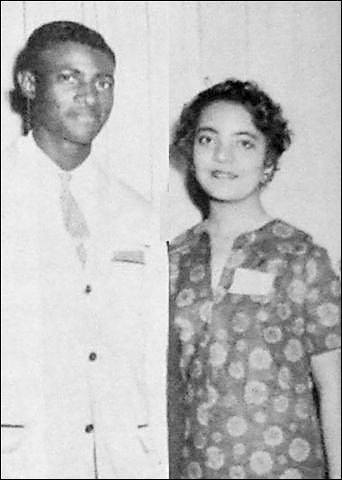 On July 19, 1958, students Ron Walters, his cousin Carol Parks-Haun, and others organized a sit-in. 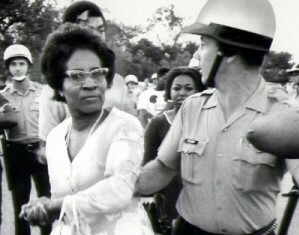 Clara Luper and the NAACP Youth Council began sit-ins to desegregate lunch counters. 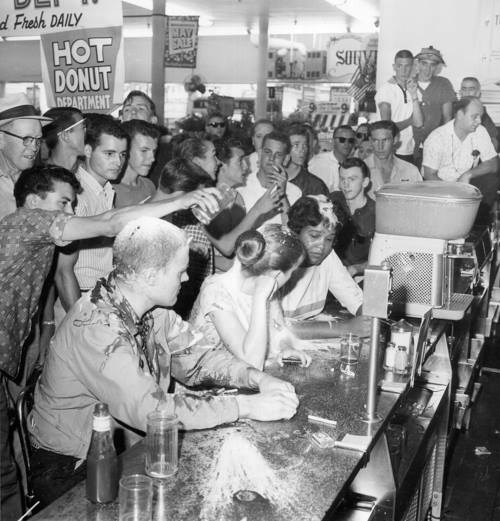 A group of college students and professor did a sit-in at the Woolworths Jackson, Mississippi.